I have always been amazed at the way that politicians (who are ultimately my “bosses”) get off easy. Why does your place at the top of the food chain give you more leeway than my place at the relative bottom? In Washington, D.C. the mayor got caught on a sting doing coke. Re-elected. And now the honorable governor of New York is entangled in what cops call a “whore caper.” He gets to resign. If a street cop in any of these jurisdictions got caught in the same situations — fired on the spot. I guess the more responsibility you have, then less responsible we expect you to be. Kinda sad. By now you have, no doubt, seen this story or another like it. Berkely has told the Marines (in a LAW) that they are “not welcome” in their city. I am beside myself. Believe me when I tell you that I am not exactly a Berkeley liberal (ahem…cough…cough). But come on. How do these idiots carry on the sham that Berkeley is the place where freedom of expression truly is free? Hell, Berkeley was supposed to be the last place left on earth where you could say anything. I guess that only counts if you want to express yourself andagree with the shameful, treasonous, ivory-tower-dwelling politicians on the city council. 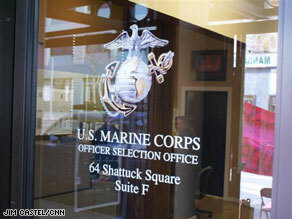 They actually said, “You are not welcome in our city.” The amazing thing is that all the hard working Marines I know and trust would die tomorrow to protect the Berkeley City Council’s freedom. I wonder if the feeling is mutual? Shame on you, Berkeley, and sleep well tonight. Sorry about the long title, but I couldn’t think of any other way to put it. I am going to do my best (and most likely fail) to keep out of this presidential race. Normally I get so stressed about them it drives me into an election year hysteria. Interesting, however to note what NYPD’s Sergeants and Captains did here. You probably recall that “America’s Mayor” was presiding when 9-11 hit. What you might not know is that New York cops work for poverty wages, under the worst benefits and pay plan of any big city cop in America. Period. That might come as a surprise, since they are so famous. Giuliani stopped their pay for 3.5 years. No raises at all, when they already are making next to nothing! Are you kidding? And Giuliani’s heroes in blue? Barely above poverty wages. Disgusting and unacceptable. I hope he is ashamed of himself.